Wealden Astronomers meet at Herstmonceux Village Hall on the First Friday of every month. We are members of the Federation of Astronomical Societies and also have Public Liability Insurance. 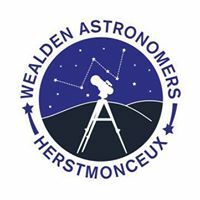 The next meeting of the Wealden Astronomers will be at Herstmonceux Village Hall on Friday 1st March 2019 at 7.00 for 7.30 PM - Tea, Coffee & Biscuits. The Speaker for this evening will be Dr Stephen Wilkins (East Sussex University). As we look out into the Universe we also look back in time. Eventually we reach a period before stars (and galaxies) had formed; these are the Dark Ages. The Dark Ages were brought to an end by the formation of the first stars and supermassive black holes some few hundred million years after the Big Bang. The identification of these first objects is one of the goals of modern extragalactic astronomy. While tremendous progress has been made with the Hubble Space Telescope (HST), its small[ish] mirror and lack of infrared capability limits its ability to probe this critical period of the Universe’s history. The future is the James Webb Space Telescope (JWST), due to be launched in 2020. It is the successor to both the HST and the Spitzer Space Telescope. The JWST is a collaboration between the European Space Agency (ESA), NASA and the Canadian Space Agency (CSA/ASC), and holds out the promise not only of finding the first stars and galaxies but also of revolutionizing all of astronomy. Stephen Wilkins is a Yorkshire-born astrophysicist, currently exiled to the rolling hills of the South Downs. After studying at Durham and Cambridge (UK), where he obtained a PhD in Astronomy, he worked as a researcher at the University of Oxford. In 2013 he obtained a lecturership at the University of Sussex and in 2016 he was promoted to senior lecturer. Since 2018 Stephen has also been a Leadership in Public Engagement Fellow, specifically concentrating on the forthcoming James Webb Space Telescope. His research focuses on the formation and evolution of the first galaxies to form in the Universe. This research combines both the running of computer simulations and the analysis of observations, predominantly from the Hubble Space Telescope.